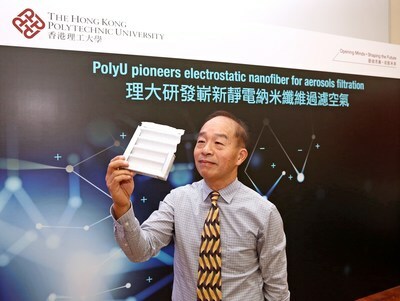 HONG KONG, March 27, 2019 /PRNewswire/ -- The Department of Mechanical Engineering of The Hong Kong Polytechnic University (PolyU) has recently developed an electrostatically charged nanofiber filter with multiple separator layers, which can capture pollutant particles that are below 100 nm in diameter (covering the most common airborne nano-particles and viruses). The novel nanofiber filter demonstrates better performance in terms of breathability, filtration efficiency (10% higher than the conventional electret microfiber filter), and shelf life (up to 90 days). Comparing with other filters made with charged microfibers or uncharged fibers on the market, PolyU's novel filter have much enhanced filtration efficiency, yet without increasing pressure drop over time (higher pressure drop means a filter facing higher airflow resistance, and thus being less breathable for the mask user or reduced flow rate for a space filter). The PVDF nanofiber has proved to be stably charged, with charging effect staying for almost three months. In prior literatures on charging other nanofibers, the imparted charges usually dissipate within a day. In filtration tests for aerosols of various sizes conducted by the PolyU team, the charged PVDF nanofiber filter demonstrated pressure drop of only 5 Pa (Pascal / unit of pressure) and a filtration efficiency of about 54% for the 100 nm particle (i.e. after the air flow through the filter, 54% of the nano-particles of 100 nm in diameter being trapped), compared to 17% of non-charged PVDF nanofiber filter. There was also a 2.7 fold increase in "quality factor" — the ratio of filtration efficiency over pressure drop, or the benefit-to-cost ratio. The higher the quality factor, the better is the filter's performance taking into account the importance of both filtration and breathability. Professor Leung said as viruses usually carry negative electrostatic charges, they can be captured very effectively by the positively charged PVDF nanofibers. "The filter or face mask applying our innovation would therefore be an ideal defense against virus during an outbreak." Charge on filter medium and its related electrostatic effect will dissipate with time. Filter durability test proved that PolyU's novel electrostatically charged nanofiber filter with multiple separator layers could maintain a persistently high performance for an extended period, and is thus more durable and can store for a longer time. Filtration efficiency tests in humid ambient of 80% relative humidity (Hong Kong's average annual percentage of humidity is 77.0%) for filters with four electrostatic separator layers (with 1.75 grams of fibers per square meter) showed that the filtration efficiency dropped only marginally after 15 days, and dropped only 1% after 90 days. PolyU's innovation can be widely applied in air filtration, from industrial to personal and household applications. Industrial usage includes dust-free rooms and fossil-fuel power stations. Air filtration can also be used to reduce particulate emission from exhaust of ships and vehicles. Personal and household usage of air filtration includes facemask, air purifier, vacuum cleaner, window filter screen, etc. The electret PVDF nanofiber filter can be used in Western Blot, an analytical technique widely used to detect or extract proteins. In the process, PVDF membrane is often used in transferring proteins separated from the original sample. The PolyU innovation can help greatly enhance the nanofiber mat's electrostatic force in capturing protein, while maintaining the protein integrity without affecting its organization.